Letterlicious is a very seductive game, as Jeff Widderich and I have found after spending way too much time on the website version instead of doing real work. We hope you like it as much. Jeff and I developed the game from his original paper concept in around 2010 and we knew this had to be an App. It is so suited to tap and play. It's a very simple but finely balanced game where there is just enough space to make a crossword grid from the letters available. Just - it can be tricky, and this is entirely down to your skill and wordsmanship. The only randomness in the game is the selection of starting words and tray letters. At the bottom of the board is the Letter Tray. To finish the game you need to try and use all the letters in this tray - that will get you the most points. 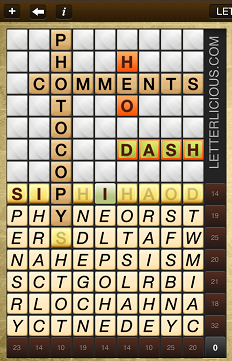 However, you can't just pick any of these letters: you can only select the ones at the top of each column. These are marked in a brighter yellow tile and shown on the first diagram with the arrows. There are always two starter words. The vertical word may be short - about eight letters - or it could be quite long and descend into the tray. Until you get near the end of the game, you will always have at least nine letters to choose from. More than enough to make some words. You don't have to use all the letters. The key idea, though, is that you get more space to play with as you use up letters. Tapping with a finger on the yellow letters turns them green and I can tap in an empty cell to place that letter. Every time you place a letter the game checks to see if you have made a valid word. In this example I've placed an invalid word with the H and O and it shows this by turning the letter blocks red. Valid words (likes DASH here) that are not connected to the starting words are not allowed either. These are indicated by green letters with a red border. You have to think about connecting the words you want to make to the structure you are making. If you have played Scrabble, you will be familiar with this idea. Try not to block yourself and think ahead. The remaining letters in the tray will help you decide where to go. 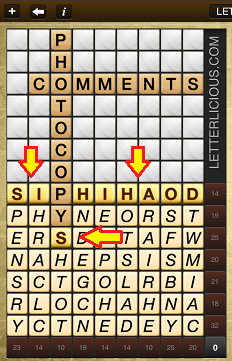 Now I have correctly placed the letters H, A and D to make HEAD but the isolated letter O is not allowed. Isolated letters like the O are not valid. Effectively this means one letter words are not part of the game. Please note - submitting is final - you can't undo a position if you find it's led you into an awkward position. But you can restart the game using the Restart button. You can see that the three letters I used to make HEAD have disappeared from the tray and I can now try and use O, R and T. The letter S is extremely useful. I can extend previously placed words. Here I have placed the word CRISIS and made HEADS. Longer words are good for your score. Every letter beyond three counts +1 as a bonus. So a four letter words give you +1, a five letter words +2 and so on. 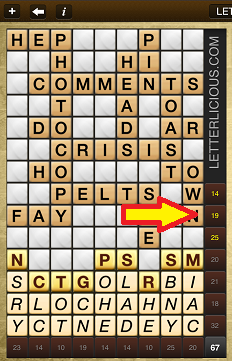 Theoretically you can fit a fourteen letter word on the board and get +11! The bulk of your score will come from using up all the letters in a row or column. There are score values on the side of the board which tell you how much each row and column is worth. These are based on roughly equivalent values in the game of Scrabble and represent how frequent the letter is used in the English language - and how hard it is to place. So E is valued at 1 and Q at 10, for example. You don't really need to mind the score on the side. It will be added automatically as you progress through the game. Since most games solutions will normally use all the letters, beating the Champions in the Championship game is all about placing and building up longer words. Of course, you may not have the right letters - or you may not have left quite the right space to fit a word - that's the challenge and the intrigue of the game. When you have finished all the letters or gone as far as you can, you can "Submit Your Game". Your solution can be compared to everyone else's and if your score is high enough, your solution will be displayed in our top 10. Congratulations if you manage this achievement! This game is designed for one person. You can start, quit and resume any time and your progress will be saved (at each Submit point). These are great if you are just getting into Letterlicious and want to practise or try lots of games. When you have finished, or you just want another game, use the + (plus) button at the top of the screen. It will create a new game. There is no history or saved games with Solo. Just the current game. The arrow button takes you to the main menu. Great if you'd just like a bit of competitive fun with a friend. Like Solo, just the current game is present and it disappears when you ask for a new game. Be warned - it has the potential to cause upsets! It's not just a matter of accumulating the greatest score. Your score can go down if the other player poaches your word! They can do that by extending it and then it becomes a new word and goes into their list. Since big scores are available for rows and columns so you'll want to be careful what you leave behind for the next person. So there is a good deal of strategy! Each player must place at least one letter and make one word in order for the game to progress. Every day there is one puzzle you must attempt. This is the same puzzle available on the home page of www.letterlicious.com so everyone gets to compete with everyone else. You can view the best ten puzzle solutions for the last seven days online and see the daily and monthly championship lists from the buttons in this player screen. When your score is above zero you may at any time Submit Your Game. You will need to register your email address and a name or 'handle' so you can be uniquely identified. Only your name/handle is visible publically. The email address is used so your submission doesn't conflict with anyone else's account. Because you can submit progress at any time you have the whole day to find the best possible solution and score. (This does mean you can overwrite a good game with a poorer restart). The puzzle changes at midnight EST (US Eastern Standard Time) to check your time zone for the deadline. You can use with the App or the website to play the Championship Daily. This is rather experimental and we'd love to hear you feedback on this. We wanted the ability for remotely connected iPad and iPhone users to be able to play the Two Player game. You will need a Game Center identity. Game Center will attempt to connect you to a random remote player and you can see who can get the highest score. For longer words we used a word list provided by the Internet Scrabble Club. We have chosen the TWL list which contains around 161,000 words. We are not using the much larger SOWPODS, ODS or Zinga lists - which are exceptionally large and contain many scientific and medical terms not in common usage. If you want to contact us about the app or the puzzles, there is a feedback form at www.sudokuwiki.org/sudokufeedback.asp or you can contact andrew@syndicatedpuzzles.com directly. Best of luck playing Letterlicious! Syndicated Puzzles Inc is registered and based in Canada.